22. Jahreskonferenz 2015 in Helsingör (Dänemark) | Verband der Geschichtslehrer Deutschlands e.V. History, Heritage and Citizenship Educators across Europe and beyond are invited to participate. 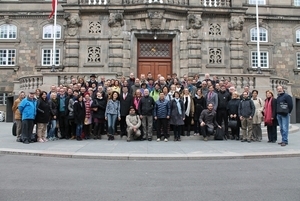 The 22nd EUROCLIO Conference in Helsingor, Denmark took place from 20th-26th April 2015. Participants of over 40 different nationalities took part in a series of workshops, speeches and activities designed to give an impression of Danish Historical Education and society as a whole, as well as to create new ties between historical educators from across Europe. 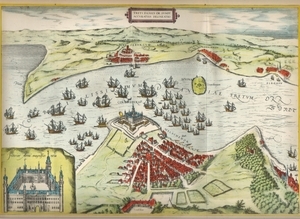 This conference was held in joint co-operation with EUROCLIO Member Association, the Danish History Teachers Associations and our partners in EUSTORY, with both organizations hosting an ‘Interactive Debate’ on Tuesday 21st April. This brought together a panel of experts (Maria Ecker, Jens Dalsgaard and Ioannis Dimitrakopoulos) to discuss the issue of ‘Teaching and Discussing history, identity and citizenship in 21st Century Europe’. Time was also allotted for questions from the audience to try and promote a wider discussion amongst conference participants. Throughout the week, a packed programme gave our participants the chance to see wonderful speeches from distinguished individuals from Bo Lidegaard and Antoon de Baets, a series of informative workshops from a variety of our skilled contributors and a chance to witness the Danish educational system at work in visits to schools in the local area. A new idea that proved to be particularly successful at this Conference was the first EUROCLIO ‘World Café’. This brought together all our participants and contributors in discussing the role of history teachers in an increasingly globalized world. This was a particularly popular event amongst our participants as it allowed them to actively contribute to an important discussion. Other events included the International Pub Quiz which fostered a sense of (healthy!) competition amongst the various nationalities in each team and a series of Open Sessions proposed by participants that allowed for them to take the initiative and led their own projects.